Welcome to the Flyball N~R~G team web page. Flyball N~R~G was registered with the North American Flyball Association in October 2004 and U-FLI in July 2007. Our membership is comprised of a mixture of experienced handlers and new people to the sport. The club is located in Winnipeg, Manitoba and trains at 884 Bradford St. The name N~R~G --energy-- reflects the attitude of the members. 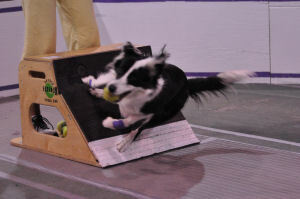 Flyball N~R~G were the first team in the region 8 to run under 16 seconds with a time of 15.91. Our fastest time in U-Fli was 15.87.